John Ray was born in Black Notley in 1627 in a cottage whcih still stands in Bakers Lane. His father was the village blacksmith and his mother was a herbalist. 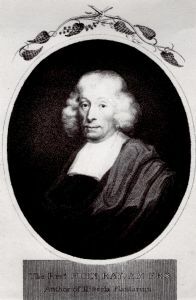 John Ray made a profound impact on the development of natural history in the 17th century and beyond and has been described as Britain's greatest field naturalist. After studying at Cambridge University, he travelled widely and wrote numerous books relating to plants, birds and insects. His greatest work was a three-volume classification of around 18,000 plants, Historia Plantarum. 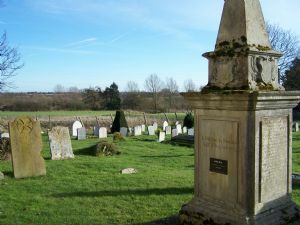 John Ray died in Black Notley in 1705 and is buried at the village church. His memorial is shown above overlooking the churchyard and neighboroung fields. It is one of the landmarks on the John Ray Walk. Our Flower Festival in May 2010 celebrated the wonders of the natural world, in memory of John Ray. 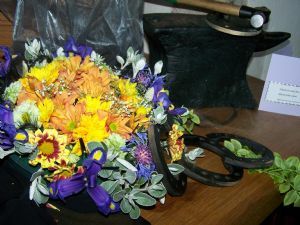 The arrangement below used items depicting the Blacksmith's forge where he grew up.